For this special event Layers of Color has created a delicious blog hop showcasing Layers of Color products on cakes, cards or anything fun to help celebrate all February Birthdays. This is also the month that Laura Campbell (the owner and creative genius behind LOC) welcomed her first grandchild into the world. Congratulations Laura and family! In honor of Laura's special news I decided to make a card and cake slice to welcome & celebrate Baby Landon's birth. I chose to make my own patterned paper by using Layers of Color Botanical Swirls Art Stencil. 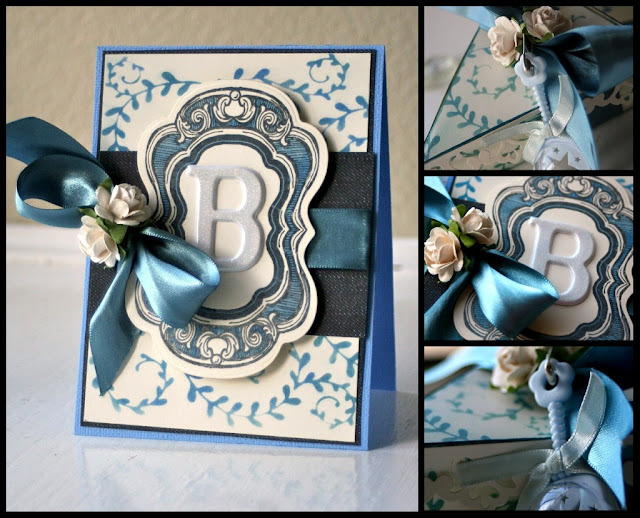 To achieve the look simply ink through the stencil with shades of blue ink onto white cardstock. I used part of the stenciled design for the front of my card. For the cake slice I printed out a template from Mirkwood Designs and stenciled the pattern on the template before cutting, scoring and folding. 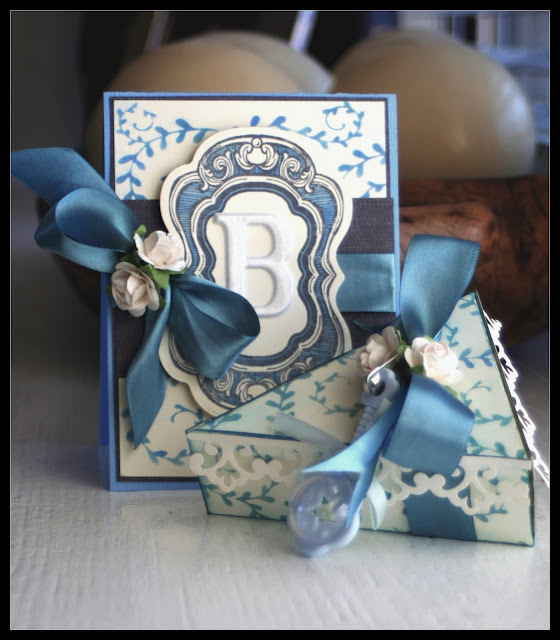 The beautiful frame is one of Layers of Color's collection of stamps that were specifically designed to coordinate with Spellbinders die templates. The Victorian Frame cling art stamp pairs snugly with Spellbinders Labels Fourteen (which you can get for 15% off if you get an item from the Stamps for Spellbinders Collection). Be sure to swing by Layers of Color Boutique and grab a FREE Cupcake Card Template! 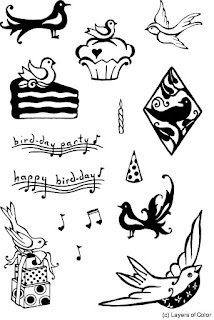 In celebration, they have added some SALE items and Special Bundle offers with fabulous pricing on Spellbinders Dies! Tasty isn't it? Let's have some more!...You're invited to feast your eyes on the Layers of Color Design Team and Guest Designer's Cake Party treats! I hope you all enjoyed yourself on this delectable hop! 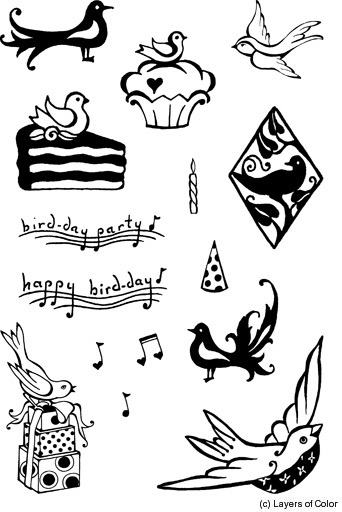 Good luck winning that fabulous prize and don't forget to get your free cupcake template! See you in a couple of days. absolutely gorgeous! What a beautiful card. Love the die you used and it is just AWESOME! For Landon! Kazan you've warmed my heart so much that my tears are melting down my cheeks! Thank you my sweet friend! It's stunningly beautiful! Truly a masterpiece! So elegant , so gorgeous creation. One piece for me , please , lol. Elegant and delicious cake! Beautiful hues of blue. What a sweetheart you are, this is so beautiful and I love that you took the theme and created it as a baby boy cake. Great work on creating your own patterned paper. Oh this is so beautiful!!! Love the entire set!!! Love the frame and the blue... how sweet!!! What a beautiful ensemble you have created Kazan! Love the colors, the stenciling and those flowers. Just perfect! This is just so fabulous! I LOVE the blue theme. Your creations are gorgeous. With all the pink cakes so far, your blue and white piece stands out. So many wonderful details. Thank you for sharing!! OH My! This is so yummy! and would go perfectly in my kitchen I might add :o) I have a blue and white kitchen! Wonderful! These are so elegant! Who would have ever tought blue would work for cake pieces like this! WOW! Me encanta los colores, y el set se ve estupendo. Beautiful and elegant! I love the blue theme! This is so pretty.. I LOVE your colors.. You did a great job on this decorating party. Love the way you have used the stencil, colour and ribbon to tie these two articles together. They make a stunning duet. This is so pretty, I love the blues. Oh, Kazan, I just absolutely love what you've done here. Love the stencil you chose to use and the color scheme. Don't you just love the elegance satin ribbon adds? Just fantastic! What an absolutely gorgeous and elegant baby boy set...WOW!!!! The colors, ribbons, stamps, details...everything is fabulous!!! Kazan this is stunning. I love the rich blue you used and making your own pattern with the stencil was a fabulous idea. What a beautiful way to celebrate the birth of a baby. Congrats to the parents. Gorgeous card and cake!!! Love the DP you used!! Awesome job!! Such a sweet set! Beautiful job! This is absolutely gorgeous! Loving the blue and white combination, so very elegant! The matching card is also out of this world! Thanks for sharing, blessings! Love all of your projects. Love spellbinders. All of your work is gorgeous. Love the trio you did. Sometimes I only think "cards", when I think of Spellbinders dies, but there is so much more you can do. This project is a great example of that. WOW! WOW! WOW! I can't get enought of all your lovely cards and things. Truely amazing. Thnx for sharing.